(Central Islip, N.Y., June 10, 2015) – Did you miss attending Wednesday’s Ducks game? Well, Ducks season ticket holder Ginny Steel didn’t, and she is now $10,000 richer! 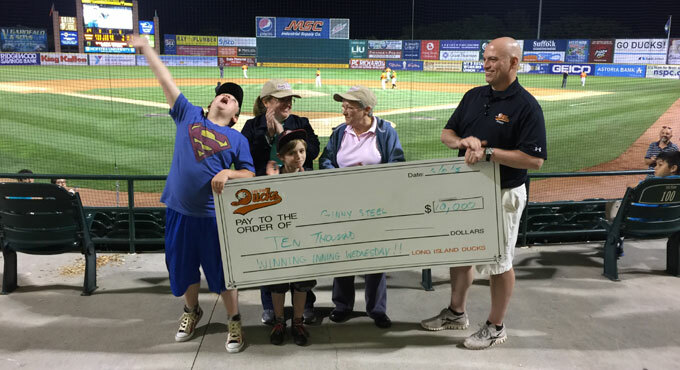 During the Long Island Ducks game against the Southern Maryland Blue Crabs on Wednesday, June 10 at Bethpage Ballpark in Central Islip, N.Y., Ducks season ticket holder Ginny Steel won $10,000 as part of the team’s Winning Inning Wednesday promotion. CLICK HERE to listen to the Winning Inning Wednesday as it occurred! At each Wednesday home game, the Ducks will designate a specific occurrence for each inning. If the event takes place during that inning, one lucky fan will win $10,000. To be eligible to win, fans need to simply sign up prior to first pitch at the Long Island Ducks Ticket Kiosk, located on the main concourse behind home plate. Ginny earned the prize after the Ducks scored seven runs in the seventh inning of Wednesday’s game. Long Island had designated a seven-run seventh as the occurrence for that inning. Thanks to the rally, Long Island came back from a 9-3 deficit to earn a 10-9 victory, the team’s 10th win in a row. It was just the second Winning Inning Wednesday of the season for the Ducks, who are debuting the promotion for the first time this season.